Somewhere drifting in space is the beautiful Algo Star System. Around the parent star, Algo, whirl its three children - Palm, Mota, and Dezo. Closest to Algo is Palm, the economic and intellectual stronghold of the system. Thinkers and rulers live here, high in ivory towers, away from the hubbub of everyday life. Next is Mota, the shining jewel. This fertile farm planet is a tropical paradise, peaceful, prosperous, and happy. On Mota everyone has everything that they want. No one has to work hard - or even work at all. Dezo is farthest out - and the most mysterious. Not much is known about this dark planet. Among the planets, Mota's history is the most troubled. From far in her past comes the legend of Alis, the courageous young women who fiercely fought - and succeeded - in ridding Mota of the evil oppressor Lassic. But now another tragedy oppresses Mota. This one is far worse than Lassic, being not a person, but an unknown evil! Everything is affected by it - the climate, the machinery, even nature! On Mota, strange, vicious creatures infest the country-sides. They terrify and destroy! No longer does anyone venture outside a city - unless they don't want to return. What's happened to Mother Brain, the controlling entity on Mota? Why have things gone so wrong? Who is smart enough to solve the riddle? And who is brave enough to save the planet? --From the Genesis Phantasy Star 2 instruction manual. 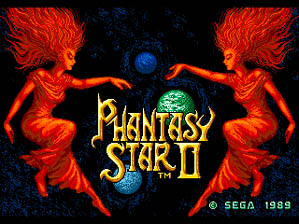 Play Phantasy Star 2 Now!